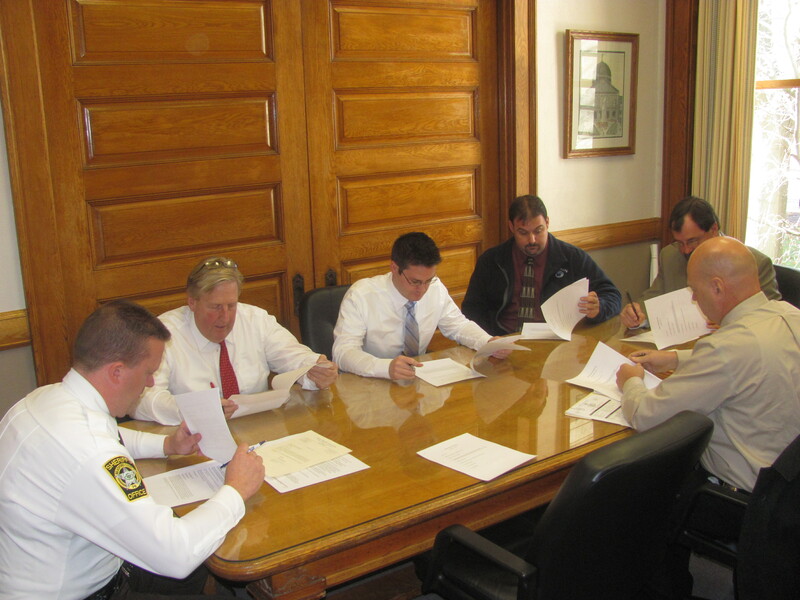 Bradford County Prison Board members in attendance at Thursday’s meeting included (from left) Sheriff C.J. Walters, County Commissioners Doug McLinko and Mark Smith, Deputy Warden Pete Quattrini, Commissioner Daryl Miller, Warden Don Stewart, and (not pictured) Judge Maureen Beirne and District Attorney Daniel Barrett. As of Nov. 14, Bradford County was not footing the bill for any of its own inmates at facilities outside the county. At the monthly meeting of the Bradford County Prison Board, Warden Don Stewart announced that there were 162 prisoners at the Bradford County Correctional Facility (BCCF). Six inmates were temporarily out of the jail for trials and other reasons. Female prison population is down to 23, and four prisoners are out on supervised bail, a program initiated in October to help keep prison population in check. Stewart was asked if the seemingly slow roll-out of the program was due to lack of participation by the county’s four district magistrates. Stewart related that he had met last week with the judges and thoroughly discussed the supervised bail program with them again. “We are hoping that they are a little more familiar with it and that things will start picking up now,” said Stewart, who added that another hurdle in the implementation of the program was that the enforcement officers had not yet received lethal force training. Stewart passed on to fellow prison board members copies of a new tobacco ordinance that had been drafted by County Solicitor Jonathan Foster. “In the past, tobacco was not considered contraband in a criminal case,” Stewart explained, even though it was not permitted inside the facility. Prisoners are not permitted to use tobacco, and visitors are strongly warned at the entrance about bringing cigarettes into the jail. Employees are permitted to smoke only in their vehicles in the parking lot. The board received a letter from the Athens Borough Council expressing gratitude for work completed by a crew of inmates in the Community Workforce program. The board also received two more requests for workers. Towanda Borough asked for a crew to pull weeds between the Merrill Parkway and the railroad tracks, and South Waverly Council requested assistance with painting the interior of their municipal building there. Lawson, 27, whose drug charges from 2011 were elevated to a third degree murder charge because a direct recipient of the heroin that Lawson was dealing resulted in the man’s death, was caught tampering with a security device and was charged with attempting to escape the prison. There was an incidence on Nov. 1 of one prisoner assaulting another, and, on Oct. 26, a woman came into the prison in apparent distress and then walked out of the lobby. When corrections officers ran to the front door to assist her, they could not find the woman nor any signs outside of an accident or anyone with vehicle problems. State Police were notified.